Is that it's hard to make a card for them! Don't ya' think so? I don't know about you guys, but I have a very difficult time creating masculine cards. I think I'm always concerned that it's going to end up too frou-frou or something. Or that the embellishments I use won't be 'manly' enough. Whatever! My regular stampers have been requesting some more masculine designs, so you know, when they ask - I deliver! I started with no plan, just the piece of Marina Mist cardstock in my hand asking "What can I do with this?" Well, the answer was fold it and stamp on it! I took out my Define Your Life stamp set and pulled the definition for 'Original'. 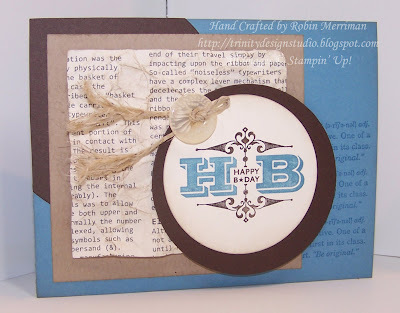 Using my Stamp-A-Ma-Jig, I stamped it 3 times with Marina Mist on the right side of the card front. 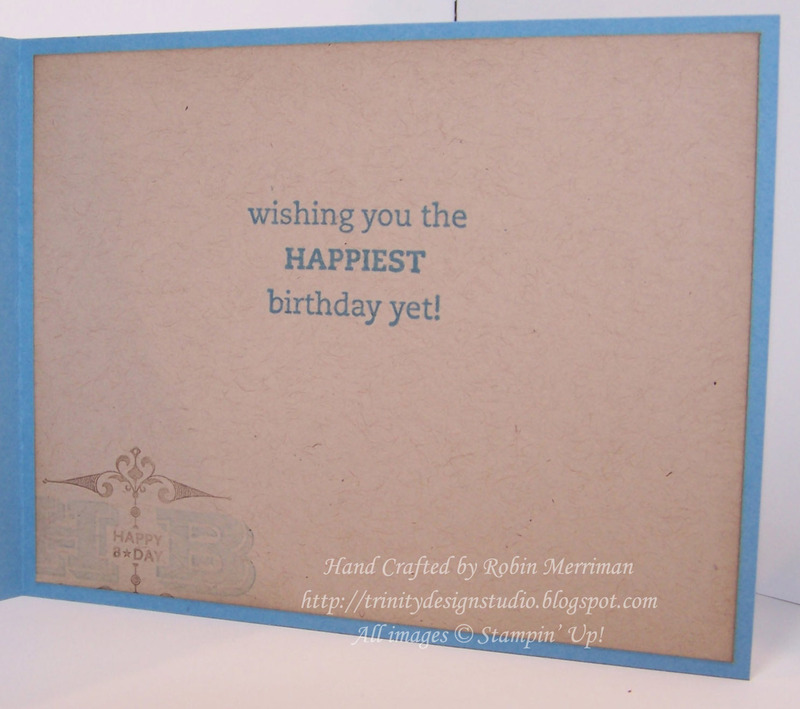 The next layer is the Early Espresso 3 1/2" Circle cut with my Big Shot, I adhered it to the card front with Tombow Adhesive then trimmed it with my Paper Snips to be even with the card edge. While I was cutting, I cut another Early Espresso Circle, this time with the 3" Circle Die and used that under my focal image. That was stamped with the Engraved Greetings stamp set using Stampin' Write Markers to color the image. I used Early Espresso and Marina Mist. Once stamped, it's punched out with the 2 1/2" Circle Punch. It's kind of hard to see in the photo, but I sponged all the cardstock and DSP with Crumb Cake ink to distress it a bit. The Crumb Cake layer was run through the Big Shot with the Texturz plates and I sponged over the words to make them pop out a bit. I love the new First Edition DSP for crumpling! It has a different feel to it than regular DSP and is Perfect for distressing! Here I crumpled it then sponged over it as well. It's attached to the Crumb Cake layer with Stampin' Dimensionals as are the circles. The button was from the Neutrals collection and I added a piece of Hemp Twine through it and fluffed up the ends. Maybe I shouldn't say 'fluffed up' on a masculine card. Let's say I ROUGHED it up instead. Yep, sounds better! See the bottom left corner? 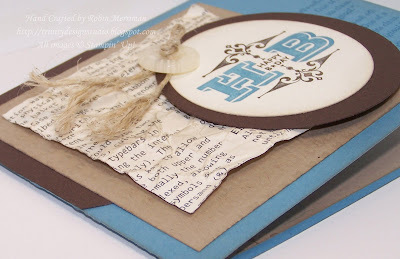 Yep, after I stamped my focal image, I huffed on the stamp and added just a peek of it on the Crumb Cake cardstock. 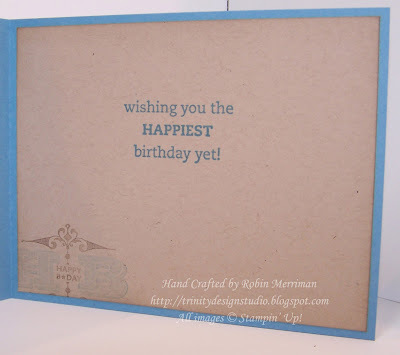 The greeting is from the On Your Birthday stamp set and I simply inked it with Marina Mist. So, there's one of my attempts at a masculine card. Wanna tell me what you think? I'd love to know since I was flying by the seat of my pants! 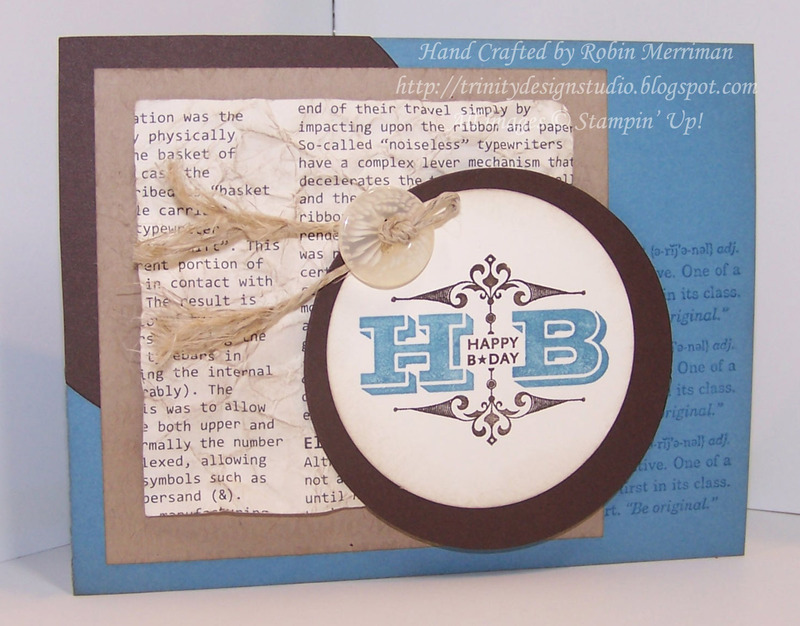 Have a great day stampin' peeps! Use the SHOP NOW Button at the top right to enter the store. Tomorrow I'll be showing you the Thank You cards I'm making for everyone who makes a purchase from my website this month so be sure to check back! And don't forget, when you do place your order, be sure to choose your FREE Sale-A-Bration items! You get one for each $50 you spend! I love it! Festive without being girly and it doesn't have trees. ☺ Perfect man card! Great job, Robin! I also struggle with the masculine cards....and it's great to visualize the card come together step by step with your description. So nice to use a something other that, "all the usual suspects" for a manly card such as Noble Deer, LAAT, etc. Also wanted to add that I really enjoyed your presentation on Crucial Conversations at Leadership in Nashville this year....you did a great job!